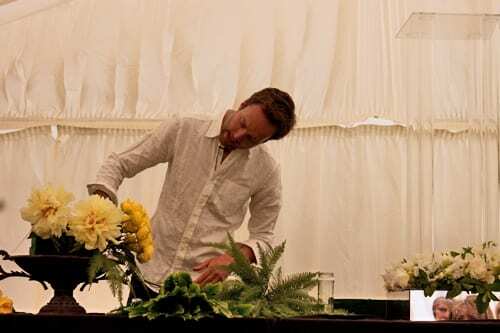 Robbie’s final design was inspired by the National Flower of Zimbabwe, the country where he grew up. The flower is the gloriosa lily. 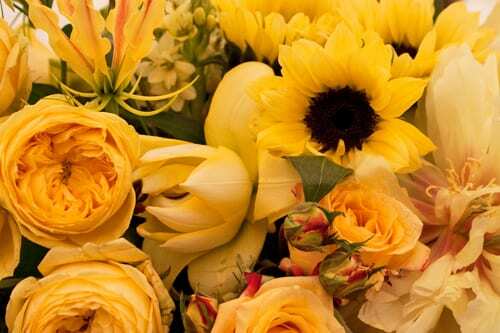 He explained that gloriosa lilies that grow in the Eastern African Highlands are yellow, with a touch of red. 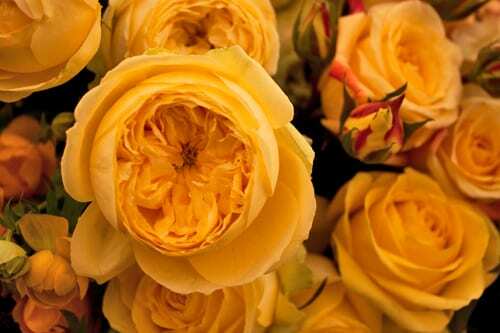 And it was this variety which he was going to use in his arrangement. 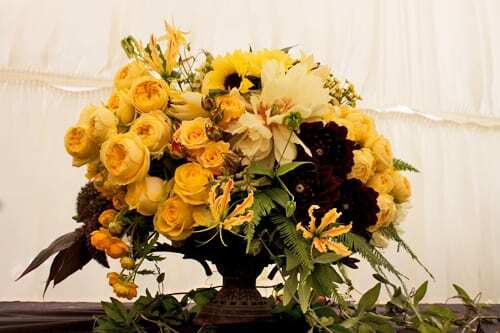 In the rest of Zimbabwe, the petals of the gloriosa lily are red, with a touch of yellow. Robbie said that he wanted to catch something of a Dutch masterpiece in his design and you can see below how he created it. 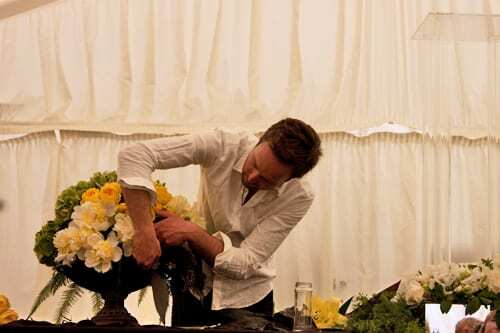 On to a metal container, he placed four blocks of soaked floral foam and secured them with pot tape. 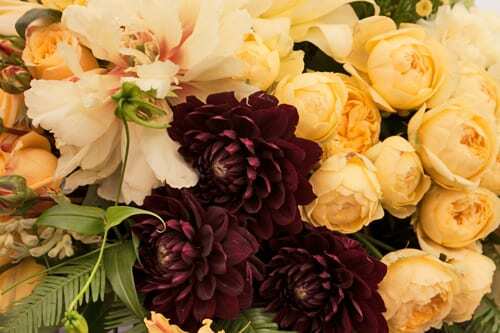 …followed by Ecuadorian roses, ‘Tequila Sunrise’ roses, kangaroo paw, matricaria, hydrangeas, carnations, ranunculus, double Oriental lilies, chincherinchee, sunflowers, dahlias, aquilegia, umbrella ferns, sword ferns, cordyline ‘Black Tie’ and pennisetum. 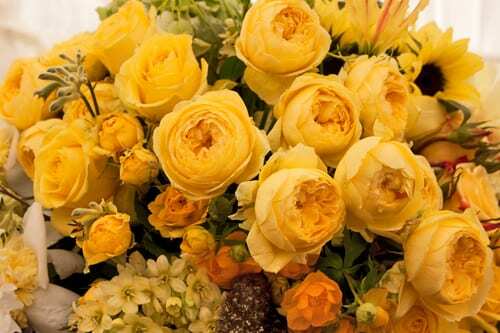 He said that he loves using different sizes of roses and spray roses, doesn’t tend to use much foliage and adores textures. By the way, if you’re using hydrangeas in floral foam, he recommended putting the individual stems in water phials and then inserting them into the foam…as being directly in water, they’ll tend to last longer. He finished off the arrangement with passion flower vine. 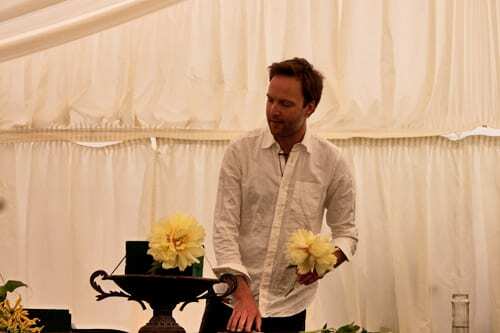 Watching Robbie create the arrangement was just like watching an artist painting a picture…constantly reassessing the position of the flowers and thinking about which blooms to place next to which. Here are some close-ups so that you can see the detail. 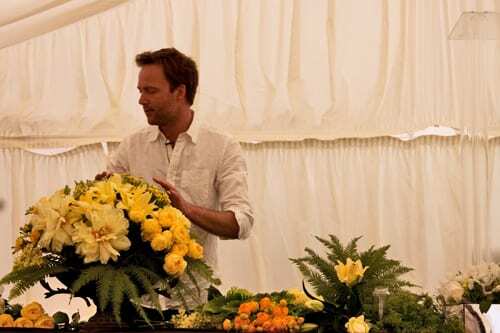 This week, Robbie’s off to America to teach at the FlowerSchool New York. If you’d like to keep up-to-date with his news, he’s on Twitter, Facebook and Instagram. Plus he has a blog. P.S. 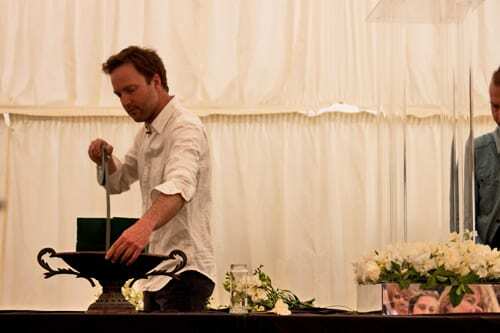 Just in case you missed them, here are Part 1 and Part 2 of Robbie’s demo at the Flower Gala.